This field manual (FM) is a guide for military police, military police investigators (MPIs), and United States (US) Army Criminal Investigations Command (USACIDC) special agents operating in all levels of tactical and garrison environments. This manual makes no distinction between the various levels of investigation, whether it is done by a uniformed military policeman, an MPI, or a USACIDC special agent. Where appropriate, this manual describes nationally recognized methods of investigation and evidence examination adopted from the Department of Justice (DOJ); Federal Bureau of Investigation (FBI); Bureau of Alcohol, Tobacco, and Firearms (BATF); National Association of Fire Investigators (NAFI); National Institute of Justice; and US Army Criminal Investigation Laboratory (USACIL). 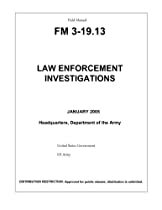 In addition to the techniques and procedures described in this manual, Army law enforcement personnel are encouraged to seek guidance on police and investigative matters from other approved official law enforcement sources. Special terms used are explained in the glossary.